I shared a guest post by Daisy on Tuesday where she talked about her experiences of internet dating. I hadn’t quite finished the book then but I have now and so I can share my review with you now. The blurb and author information are on the earlier post so I won’t share them again. Dating Daisy is a work of fiction but I get the impression it’s pretty much autobiographical. We follow Daisy as she signs up for first one, then two and eventually four dating websites. In her early 50s and just out of a short relationship which followed the demise of her 26 year old marriage to Voldemort (! ), she’s looking for that special person to spend her future with. Not backward about coming forward, Daisy makes contact with various possible dates and goes on a few too. She breaks her own rule about not meeting up with men who don’t have a photo on the site quite a few times with amusing results. I must admit to feeling a little sorry for the men in question as Daisy is a little scathing when she meets them although to be fair it’s best to be up front in the first place. The book reads a bit like a diary. It’s not limited to dating experiences. Daisy is a sexual health doctor and shares a number of stories about her patients, some of which are just bizarre. When these segments started I did wonder if it was a little odd to have them there but actually they fitted in really well and even the chapter on methods of contraception was interesting. We also meet Daisy’s friends, the Amigos and her daughter, Imogen. 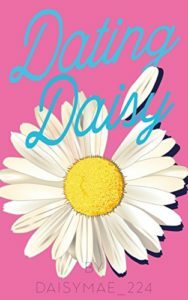 The whole thing does read just like a memoir – there isn’t the tight structure that I would expect with a novel, more a fly on the wall look at Daisy’s life during the time she spends on the dating website. Near the end I was desperate for things to work out with one of the men she meets. I won’t give anything away but I was really eagerly reading away to find out what happened on a particular date and when I knew I would have to stop reading soon I deliberately left it so that the anticipation wasn’t spoiled and I could come back to it and find out what happened later on. I had an idea that Dating Daisy would be hilarious which I didn’t find it to be, but I did smile quite a lot as the humour is quite dry and once I’d got into the swing of the writing and the key people I found it to be a fascinating look at the world of internet dating. With thanks to Clink Street Publishing and Rachel Gilbey for the review copy. Dating Daisy is available now in ebook and paperback.